1 day/0 nights. A Dakhla classic! Reach the White Dune and watch the entire bay unfolding in front of you, look for flamingos and dolphins, enjoy your lunch at the Oyster Farm together with our resident Marine Biologist. This excursion can be easily combined with other one-day classics such as Dakhla like a local and the trip to Imlili. Check our Dakhla Weekend package! 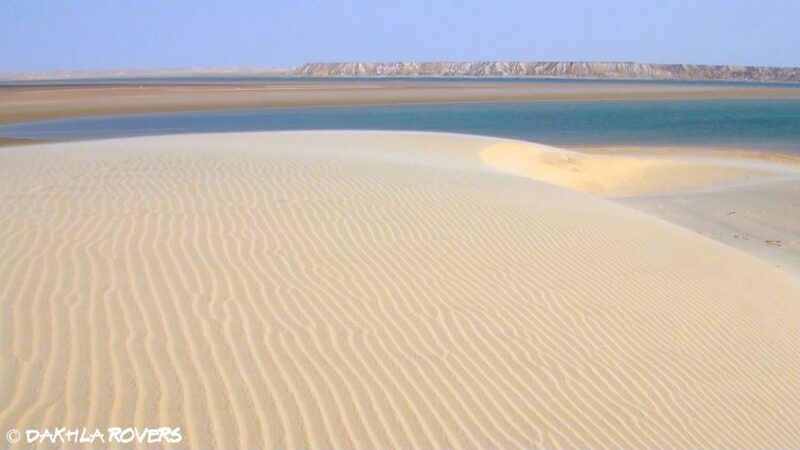 One of Dakhla’s “must-see”, the White Dune is surrounded by the ocean at high tide, flamingos often at sight. You’ll get an amazing impression of the area’s stunning colours and views, in the company of our resident Marine Biologist. We will then head back along the peninsula to reach the Oyster Farm. A long-established cooperative, it has become one of the best fish restaurant of the region. Pick your favourite among fresh oysters, baked fish with vegetables, octopus, squids or razors shells tajine, grilled lobster (notes: depending on the season and on the catch of the day, some items might not be available). After lunch, we will admire the power of ocean waves along the Atlantic coast. Return to Dakhla in the afternoon. The tour begins at your hotel in Dakhla, in the morning, and ends at your hotel in the afternoon. Lunch at the Oyster Farm is not included in the offer and has to be paid separately by each participant. Price: 120 Euro for a group up to 4 pax. Prices for coastal tours depend on several variables, including length of itinerary and number of guests. You can link this one-day offer with the excursion to Imlili, for a 2 days/1 night desert and coastal tour (Imlili & coast). Our itineraries are fully customizable and suitable for individuals, pairs and small groups up to 4-6 people – ask us for your tailored trip!